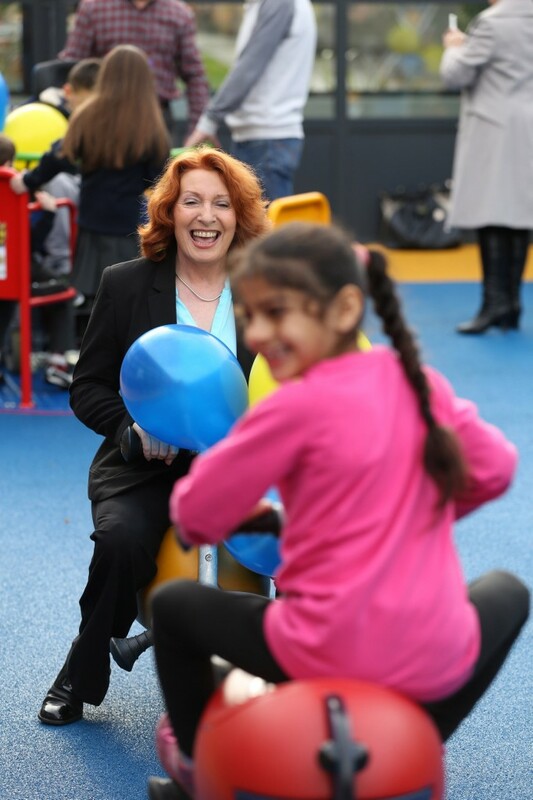 The Central Remedial Clinic’s new school playground was officially opened on the 11th November 2014 by Minister of State Kathleen Lynch TD. It is the first major fundraised project to be completed under the governance of the CRC’s new Board and CEO, Stephanie Manahan. The new school playground will provide a bright creative space in the centre of the CRC School in Clontarf where pupils can play, exercise, socialise and enjoy fresh air in a safe and stimulating environment. The previous playground was closed in 2006 due to health and safety concerns and the new playground is a much needed amenity for the all the children who attend the CRC. The new school playground boasts an array of play equipment including a wheelchair assessable carousel, slides, a seesaw, a spinner, a playhouse, a sand station for imaginative play and a specially designed “Meeting Point” space for senior pupils to socialise. It will be used in a creative and educational way and shared with other groups of young people with disabilities who attend services at the CRC.